Our team can assist you by providing high-quality bee removal services in St. Petersburg. While bees are a natural and healthy part of many ecosystems, it can still be a pain when they try to take over at your home or business. What’s the best way to get rid of the bees without causing major damage to them or your property? Live bee removal saves the bees and is environmentally necessary – but it can also be a difficult job. Rather than taking on the task of trying to complete bee removal on your own, our team can assist you by providing high-quality services in St. Petersburg, Florida. 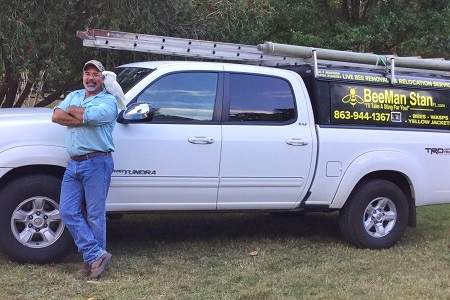 When you call us at BeeMan Stan, you can feel confident that you’ll be able to take back your indoor and outdoor spaces, and that the bees that once swarmed are safely removed. While bees may seem like pests that should be destroyed, at BeeMan Stan, we like to provide education about the importance of bees for our natural environment. With our different bee removal services, we can not only eliminate bees from your property, but also actively relocate bees so they can continue to function naturally. If you think you have bees and you call on us at BeeMan Stan for bee removal, but we discover that you actually have wasps or yellow jackets, not to worry! We can provide the proper removal services for these stinging insects, as well. We believe you should be able to enter and exit your home safely and without worry that these pesky insects will perform a stealth home invasion. We can effectively eliminate the problem and give you peace of mind that bees, yellow jackets, or wasps are gone for good. If you’d like to be sure that you don’t have a stinging insect problem throughout the year, you can also trust us at BeeMan Stan to provide quarterly preventative maintenance at your property in St. Petersburg, Florida. We believe this is the best way to tell stinging insects that they should find somewhere else to settle. If you suspect you have a bee problem, or if you are ready to schedule bee removal services at your home or business in St. Petersburg, give us a call at BeeMan Stan, and we’ll be there to help you right away! We have an excellent one-year warranty on our cleanout services, and we’ll work with you to take back your property inside and out. By far the most recognizable type of bee here in St. Petersburg, Florida, the honey bee actually has territory expanding all of Florida and even the majority of the United States. The Western honey bee in particular is the most common honey bee worldwide, and the most common here in St. Petersburg. Coincidentally, the Western honey bee, or European honey bee, is not native to the Americas. Instead the honey bee was domesticated long ago in Europe, Africa, and Asia, and has spread around the globe for its production of honey. Honey bees are recognizable by their trademark honey bee black and yellow striped pattern. Additionally, honey bees are generally short in length, have small hairs all over their body, and unlike wasps and hornets, the honey bee has a proboscis protruding from its mouth, which is used for the ingesting of pollen and nectar. Like humans, the honey bee loves warm weather (not tropical) even though they are accustomed to temperate climates. The honey bee becomes dormant in the winter but the longer the warm months, the longer the honey bee is active. Because of this, honey bees flock toward Florida for its warm climate and flora galore, which honey bees utilize for pollen. Whether domesticated or wild, the honey bee centralizes its hive around a queen honey bee. The queen honey bee gives birth to all the drone and worker honey bees. The hives which they create, which you may have seen at some point here in St. Petersburg, tend to be in confined areas such as tree hollows or even your own chimney! 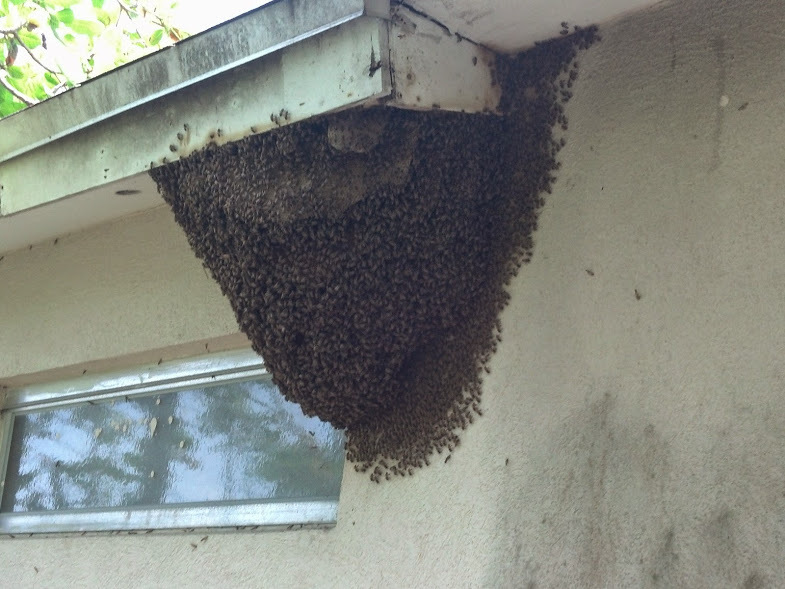 Because of their love for confined dry areas, you might stumble across a honey bee hive in your St. Petersburg home. If you do need bee removal in St. Petersburg, call Bee Man Stan to remove the honey bees from you home and relocate the honey bees to a secluded area of St. Petersburg or other locations in central and west Florida. They could even be given to beekeepers for honey production. Honey bees are integral to our ecosystem and should not be harmed but carefully removed and relocated. Western honey bees not only produce delicious honey, but in Florida and many other areas of the world, the honey bee is the key pollinator in nature. In fact, the honey bee pollinates around 30% of the food we eat. That’s equivalent to $15 billion. The bumble bee is a species of bee common to the majority of the northern hemisphere but is actually very rare in tropical areas. The bumble bee thrives in temperate climates due to its ability to regulate its body temperature. Bumble bees can actually use solar radiation, shiver, and cool themselves. Because of this, bumble bees are not very common in Tampa, St. Petersburg, Orlando, and other parts of central and west Florida. This doesn’t mean you might not cross paths with the bumble bee in St. Petersburg, because they are sometimes found. All six subspecies of bumble bee native to Florida can all be found in the St. Petersburg area and all six bumble bees can be identified by their pale gold and black colored bodies, large eyes, and completely hairy, large bodies. Like the honey bee, the bumble bee is a social bee with a queen bumble bee. In contrast to the honey bee, the bumble bee has a much smaller colony, with only 50 to 400 bumble bees in each hive. Identifying a bumblebee hive is a difficult task but a necessary one if you suspect bumble bees are a part of your St. Petersburg residence. Bumblebees avoid warm areas such as direct sunlight and prefer to nets underground, often in burrows. If they do nest above ground, odds are the bumble bees will be protected from the Florida heat by nesting in tree trunks or thick, shady areas. Once located, a bumble bee hive can be distinguished by its disorganized clumped cellular structure. Bumble bees are tremendous pollinators and vital to Floridian ecosystems. With their population decline lately, it is vital that if you find a bumblebee hive near your home to call BeeMan Stan so he can safely remove the hive from your home and relocate the bumblebees to a safe location. We specialize in all types of bee removal in St. Petersburg. We’re experienced — We have been providing bee removal in St. Petersburg for over 30 years. It is this experience that truly sets us apart and makes us one of the most sought-after bee removal providers in the area. We provide superior customer service — We care about your satisfaction, which is why we’ll work hard to earn your trust when we provide bee removal services. If you have questions at any point, we’d be more than happy to answer them. Contact us today for bee removal in St. Petersburg. We offer professional, courteous service seven days a week and accept all forms of payments. Contact us today for bee removal in St. Petersburg.